This article was written by Jen Wilton and originally published by Contributoria. The 8th session of the Committee on Enforced Disappearances was held at Palais Wilson, a 19th-century building that dominates Lake Geneva’s western waterfront and currently serves as headquarters for the UN High Commissioner for Human Rights. 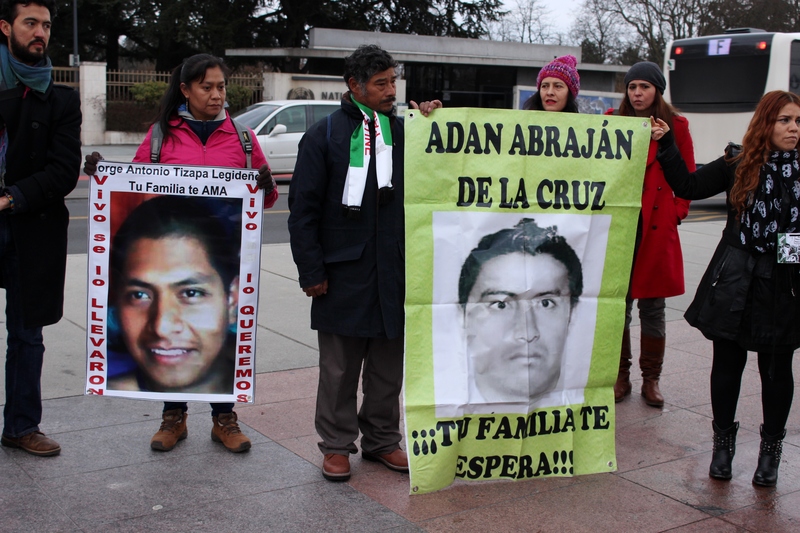 The committee met to look specifically at the alarming number of enforced disappearances in Mexico. On the first morning of the two-day hearing, thickening snow pelted down as attendees cleared security at the front gate and made their way into the imposing edifice. While I was waiting to get clearance, a small group entered the tight guards’ office speaking Spanish. I quickly deduced this was the Mexican civil society group. Nobody needed to tell me who the victims’ family members were – their pain and suffering were evident at first glance. 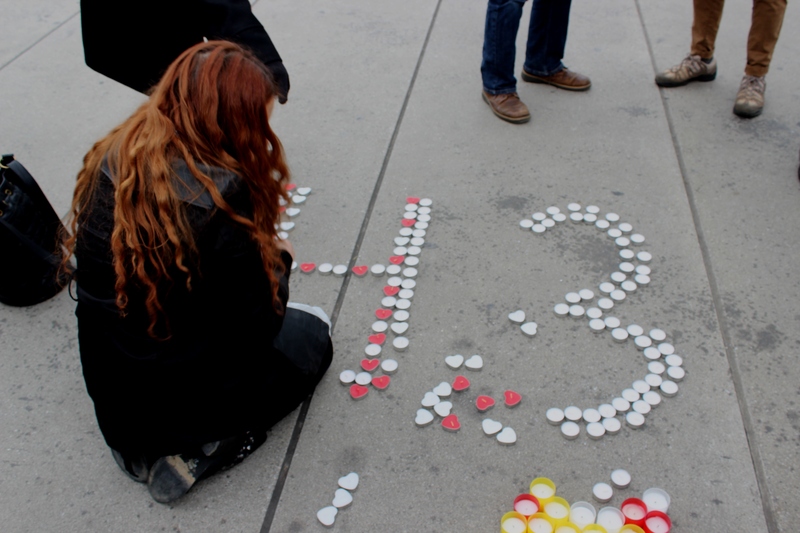 The non-governmental group from Mexico consisted of human rights organisations and parents whose children have gone missing in recent years. Hilda Legideño Vargas and Bernabé Abraján Gaspar travelled from Guerrero, where their two sons were abducted along with 41 other Ayotzinapa classmates by local police. The government alleges the students were subsequently killed by members of a notorious drug cartel. Both parents reject the official version of events and continue to search with other families for the 43 youth, holding out hope against the odds. They both say local and federal authorities have done little to help. During an extended lunch break, media representatives descended on the parents of the missing Ayotzinapa students. Their plight has made headlines around the world, thrusting them into the international spotlight. It is difficult to imagine how it would be to have to retell the story over and over. Legideño Vargas and Abraján Gaspar both demonstrated incredible strength and determination during the course of the committee hearings. The next morning, as delegates filed back into the room, the Mexican ambassador carefully circled the room, shaking as many hands as possible in the civil society delegation. 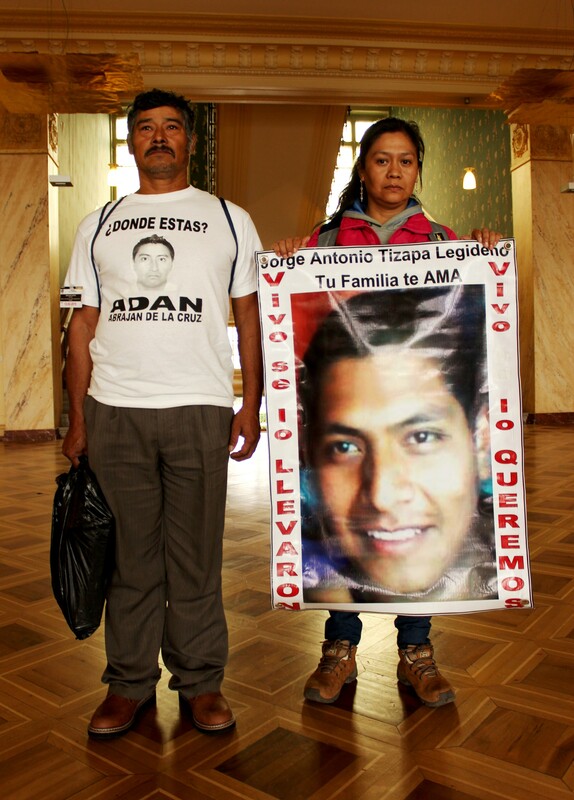 At times, Abraján Gaspar sat pensively with hands clasped in front of his face, as the Mexican government was grilled over how they respond to disappearances and what they can do to improve the worrying situation. There were audible groans from the NGO section of the audience when the Mexican government supplied incorrect information to the committee. “I am searching for my daughter Alejandra, who disappeared in 2009 in the state of Chihuahua,” Olaya Dozal explained in an interview. Her daughter was just 16 at the time of her disappearance. Dozal lives in Cuauhtémoc, a city that has experienced alarmingly high rates of disappearances in recent years. As I gently placed a kiss on Dozal’s cheek to say goodbye, her eyes welled up as she confirmed how difficult it had been to make the trip to Geneva. The strength of the victims’ family members shone through at all stages of the proceedings. I was humbled and yet also grateful for the brief conversations I had with the victims’ parents. Although nothing can change what has happened, perhaps in some small way our support can help ease the immense burden they carry. I sat in the cafeteria and talked to Mexican students who had travelled from France to attend the UN session. They kindly shared baguettes and cheese that had made the journey with them. They maintain Ayotzinapa is a perfect example of what happens to people who criticise the government. “Normally, citizens should be protected by the state, not scared of [it],” one of the students lamented. 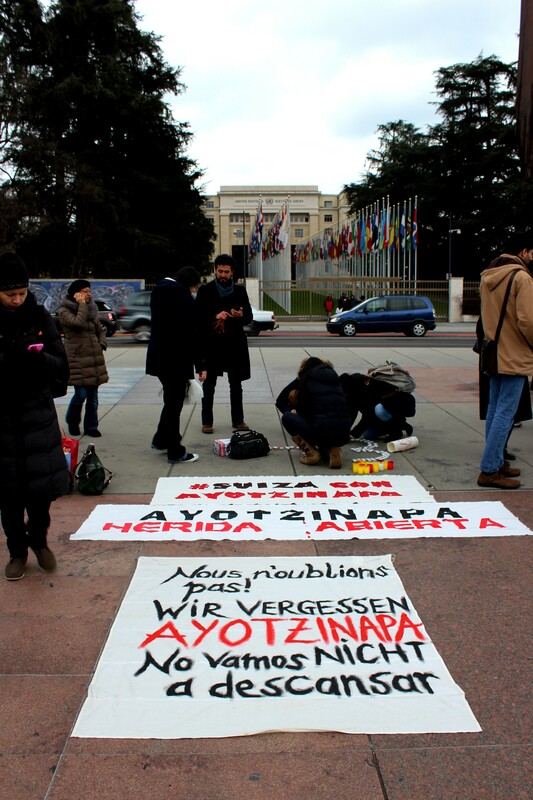 As the proceedings on Mexico drew to a close, a dedicated group from the civil society contingent braved sub-zero temperatures to gather in the Plaza of Nations in front of the UN’s main complex in Geneva. A 12m-high chair, which symbolises the fight against landmines, dominates one side of the square. Protesters gathered beside the towering structure and lit candles, hoisted banners and took part in sporadic call-and-response slogans – “You took them alive”, “We want them alive”.